One call from her father changes everything. Sophie’s dad is sick and needs her help. Her first problem is: he lives in Red Canyon, Arizona, hundreds of miles from her home in Colorado. Her second problem…is Brandon. Back in Red Canyon, years ago, he left her hanging by suddenly joining the military, leaving without a word. She never forgave him for that night, and now she has to go back to the very town he lives in, contending with small town life, family medical issues, and the ghosts of a past relationship. She hopes Brandon will avoid her, but that’s short-lived. He steps back into her life in a way she doesn’t want, or at least, so she thinks. Meanwhile, her father’s health declines, but there might still be hope, both for him, and for Sophie’s love life. 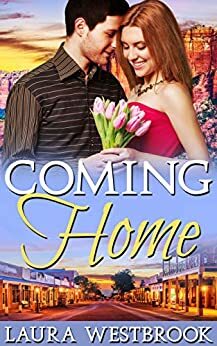 If you enjoy happily-ever-afters, sweet romances, and no cliffhangers, you’ll love Coming Home. I’ve never read a sweet romance before, at least I don’t think I have. This story was a nice read, though in some areas a little frustrating. I can’t fault the author for that though. I feel that with a little more connection between the MC and her father and former flame...this could have been a 5 star book. I struggled with some technicalities in this book, especially when it came to the bone marrow procedure process. But, what I love about it is that it inspired me to do some research and learn more about the issue. The author did a fantastic job with character growth. I’m looking forward to reading more in this series, as I feel like there’s a lot more left to learn about this cast of characters. This was such a sweet romance, I enjoyed it a lot! Sophie was a totally relatable character and a complete sweetheart. She's working so hard to make a life for herself in Colorado after leaving her small hometown in Arizona years ago. But then her dad calls her home to help with a health crisis and her whole world is turned upside down. She struggles to become his main caregiver while repairing their strained relationship. At the same time, she's reconnecting with old friends--and a yummy old flame--while building her life back up in her hometown. I don't want to give anything away, but her high school sweetheart Brandon comes back into her life, throwing Sophie for a loop. All the while taking care of her dad, she has to decide if she wants to give Brandon a second chance after he burned her so badly years ago. I'm a huge romance fan and normally prefer books with quite a bit of heat and steam, but this was a sweet and wholesome romance that gave me all the warm and fuzzies. Definitely recommend to anyone who likes sweet romances!